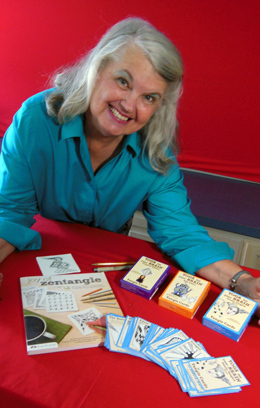 View a YouTube, get an up close view of Sandy Steen Bartholomew’s new decks of ‘Yoga for the Brain – Tangle Cards’. Full of fun Zentangle® patterns. The quirky, arty, multi-talented Sandy Steen Bartholomew has done it again. She has come up with the most adorable packs of ‘Tangle Cards’. You can choose from 4 different sets. Each set includes basic zentangle instructions, which makes it a great gift item for an aspiring artist. An index card is included with each deck listing the card number and tangle. The Kidz Edition has steps and strings especially for children, it even includes a card with variations on her cute Lilah Beans. For those who create their own tangles or want to have a deck devoted to their favorites the set of 20 blank tangle cards is perfect. Why not host a Time to Tangle Party. Each person can select a random card from the deck of ‘Tangle Cards’ and draw it on a canvas cloth. My favorite tools to use for this is the Roc-Ion Multi-Purpose Cloth and Sakura Permapaque markers. Once you have finished the game you add a few coats of clear varnish to have a lovely wall or floor cloth. Art and Soul in Portland runs from September 30 thru October 6. I am always excited to teach as well as take some classes from other fabulous artists. It was really heart warming to receive this email from one of my past students. Beautiful art quilts Joyce (joycerquilting@verizon.net), thanks for sharing. I will be teaching this popular class “Dyeing with Sharpie Markers” at Art and Soul on October 2nd and also at Sparks Studio.